Today, we added a nifty little shortcut that allows you to switch to a Direct Message (DM) when you are replying to a Tweet. Here at Sprout, we understand that not everything should be discussed in public and that’s exactly why we are introducing this feature. Here’s how it works. When you are replying to an @mention we’ll verify if that account is following you back and give you a chance to convert to a Direct Message. Simply click on the title bar and you’ll be responding privately. Note for Premium Customers: With this update, replies to public messages using the DM feature will be counted toward your response metrics (response time, completion) in the Engagement report. 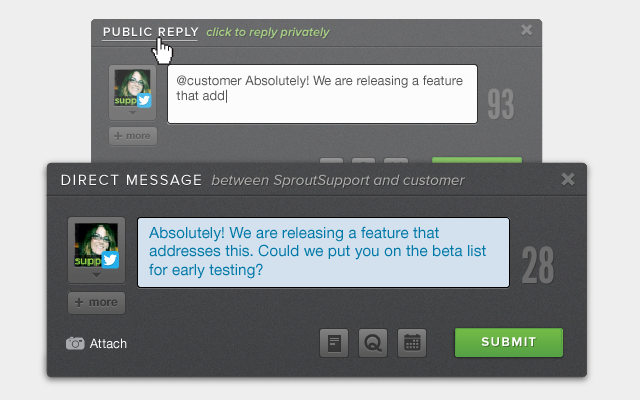 It is a best practice to be sure all replies are sent via Sprout to be counted properly. Some 3rd party systems will not attribute a reply to the original message and can skew your results. ‘Switch to DM’ for mobile will be available on the next release of our mobile apps. Stay tuned for updates. We hope this addition helps your daily engagement workflow and allows your team to Be Present, whether it’s on or off the public record.